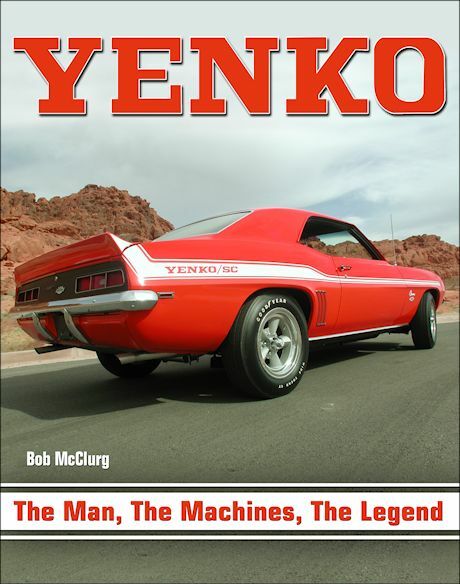 Yenko: The Man, the Machines, the Legend is written by Bob McClurg and published by CarTech Books. Even the most avid muscle car collector may not know who Don Yenko is, even if they are familiar with the term Yenko Stinger or know about one of the most famous outlets for muscle cars in the country, Pennsylvania�s Yenko Chevrolet. But now Yenko muscle cars and the man behind them get their due in Yenko: The Man, the Machines, the Legend. It started in the mid-1960s, when race car driver Don Yenko initially encountered the Chevrolet Corvair. He already had a performance shop for modifying Chevrolets. While the Corvair was basically a pedestrian vehicle, Yenko saw so much potential he took the vehicle to the Sports Car Club of America for approval to use on the professional track. With a few modifications to increase performance, the SCCA gave the request a thumb�s up. Yenko then did something that changed the appearance of sports cars forever. He took the newly certified cars and painted them white with a striking blue stripe. The cars were christened the �Yenko Stinger.� This resulted in a distinctive look for muscle cars that exists to this day. Stripes and badges became more than a trend. The Yenko treatment became a standard to a point where specialized muscle cars ended up with his name in front of it, such as the Yenko Camaro and the Yenko Deuce. Yenko: The Man, the Machines, the Legend is an enjoyable read about one of the most underappreciated leaders in aftermarket innovation. It�s far more than a look into classic Yenko muscle cars. It�s a look at a life devoted to sharing his love of the market. Yenko�s work was instrumental in the look not only for the Corvair, but the Nova, Camaro and Chevelle. With information direct from family, friends, colleagues and professionals, the book details how Yenko�s influence made it possible for these cars to go at auction for seven figures. 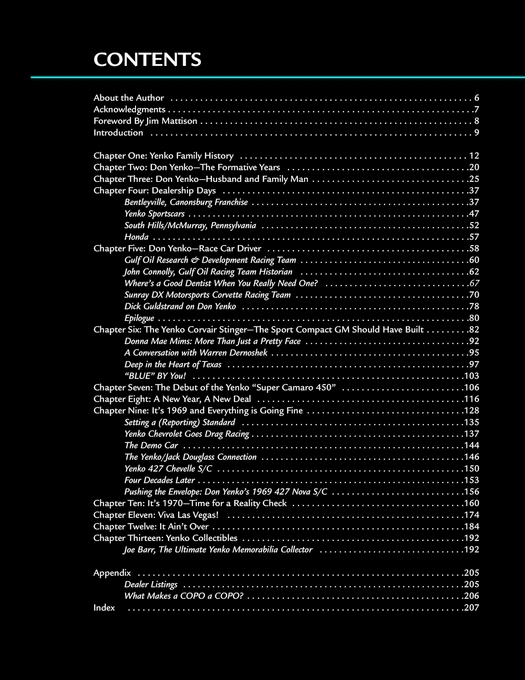 The book starts with Yenko�s Euro-American immigrant upbringing and reveals how the entire family overcame hardship and tragedy to build an automotive empire. Learn about his beginnings as a race car driver and how he convinced GM to famously modify its Nova. Yenko: The Man, the Machines, the Legend is the story of a man that wanted no more than to make cars better and how that changed an industry. 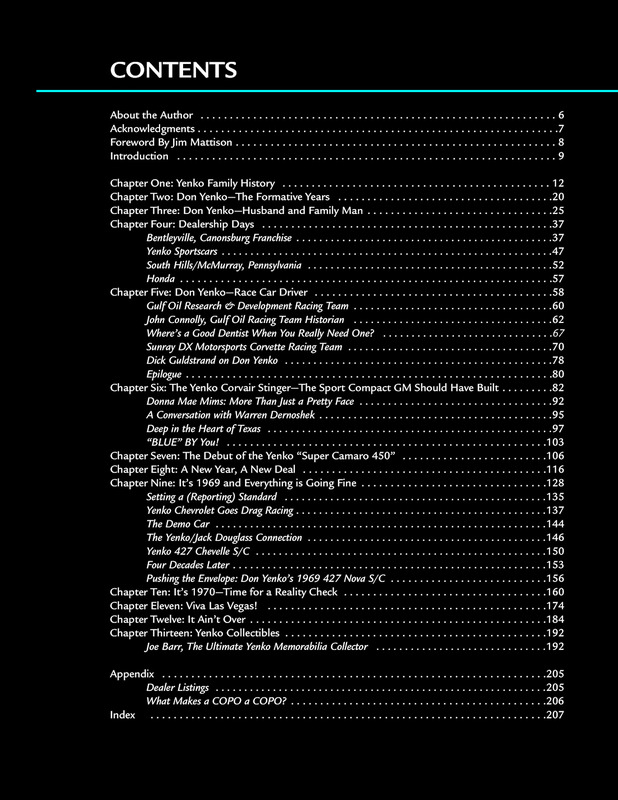 Author Bob McClurg is a big fan of Yenko muscle cars. But the photojournalist is a lover of anything on four wheels period. His books include Diggers, Funnies, Gassers & Altereds: Drag Racing's Golden Age, How to Install and Tune Nitrous Oxide Systems and How to Build Supercharged & Turbocharged Small-Block Fords. He hopes his latest work puts Don Yenko in the much deserved spotlight. 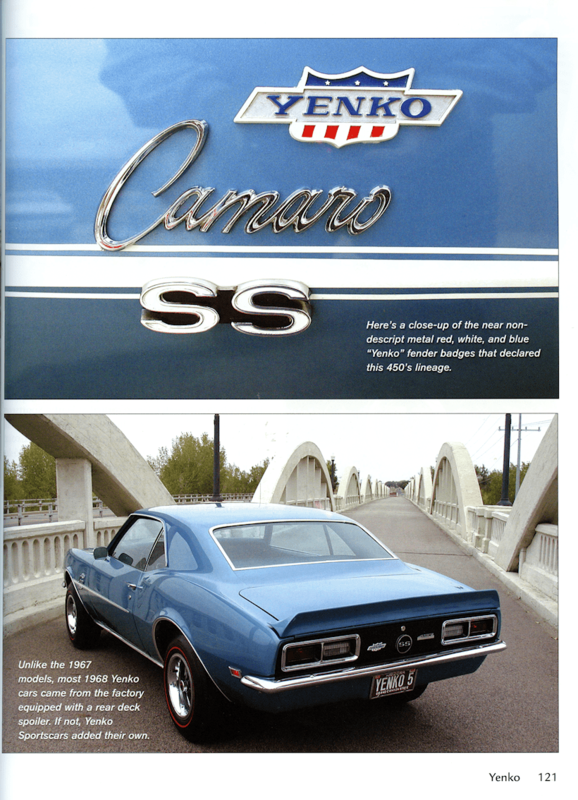 Refer to the Specifications Tab for another sample page from this book with a photo of a sweet 1967 Yenko Camaro SS. 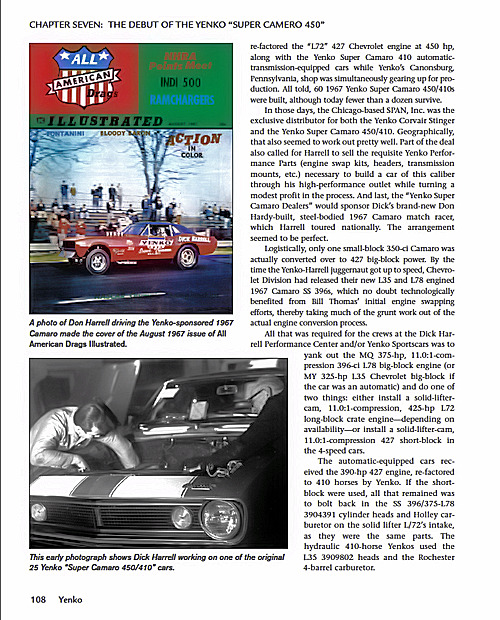 Below: Yenko The Man, The Machines, The Legend by Bob McClurg Sample Page. Copyright CarTech Books. Ask a question about Yenko: The Man, the Machines, the Legend.